Simple Definition of an IRA: An individual retirement account (IRA) is a savings vehicle that allows individuals to save money for retirement while experiencing a tax benefit for doing it. The IRS created IRAs to provide individuals an easy way to save for retirement while providing a tax incentive to save. 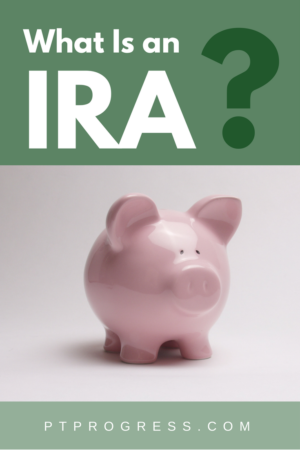 The tax benefit you get for using an IRA depends on the kind of IRA you select. There are multiple types of IRAs: Traditional, ROTH, SIMPLE, and SEP IRAs. Collectively, these are sometimes referred to as individual retirement arrangements. The money you place into an IRA has the potential to grow based on the investments you choose. In general, you can start saving money in an IRA as soon as you start earning money. Taking money out of an IRA requires you to follow certain rules and age requirements. Before you can decide which IRA to open, you need to know the basic difference between the types of IRAs available. For the general public, however, the choice will usually narrow down to two options: Traditional IRA and a ROTH IRA. For both the Traditional IRA and ROTH IRA, you are limited to contributing $5,500 per year into your account ( a $1,000 catch up contribution exists for those over age 50). The money you place in a ROTH IRA goes into the account after you’ve already paid taxes on the money. Roth contributions do not give you an immediate tax benefit, but the money you invest grows tax free and can be withdrawn tax free in your retirement. This can result in a very sizeable tax benefit in the future, especially for those who start contributing to a ROTH IRA early. The IRS sets income limits for ROTH IRAs, so if your earnings exceed a certain threshold (Single: $120,000; Married Filing Jointly: $189,000) you cannot directly contribute to a ROTH IRA. Simplified Employee Pension or SEP IRA is a good option for self employed individuals who want to save more than the allowed $5,500 limit. With a SEP IRA, you can save up to 25% of you earned income up to $53,000. The contributions are treated the same as a Traditional IRA contribution, pre-tax going in and taxed on distribution. ROTH contributions are not permitted into a SEP IRA. Savings Incentive Match Plans for Employees or SIMPLE IRA is a type of retirement account used by small businesses or self employed individuals. Unlike a SEP IRA, the SIMPLE IRA requires the employer to make a contribution into the account of the employee. The SEP IRA and SIMPLE IRA are not commonly used by the average person, but worth including in the list. You may hear people talking about a Rollover IRA, but this isn’t a different type of IRA. A rollover happens when you move one retirement account to another account. This is usually most commonly seen when you leave your employer and roll the old 401(k) over to a Traditional IRA. You can rollover pre-tax funds into a Traditional IRA and you can roll after-tax ROTH contributions into a ROTH IRA. You can even do a rollover of an IRA into another IRA as a way of combining your accounts. For those who are looking to lower their taxable income, contributing to a Traditional IRA may be the route to take. For someone who qualifies based on income and wishes to pay taxes now and withdraw the contributions and interest tax free in retirement, a ROTH IRA may be the best option. If you have a complicated tax situation or just aren’t sure, consult with a CPA or investment professional like a CFP. Deciding where to set up an IRA can be confusing, especially with multiple investment companies trying to earn your business. The process is usually pretty simple at most places, so I’d recommend looking at investment companies with lower fees. The fees on your account generally range from 0.05% to more than 1.00% depending on the company or investment fund you choose. Vanguard – Very low fees, good selection of investment options. Betterment – Simple to use, low fees, automated investing. Ally Invest – Low fees, simple platform, wide selection of funds. ETrade – Simple interface, low fees, and multiple investment options. Regardless of the investment company you choose, it’s important to start saving for retirement early. The great thing about IRAs is that you can make small contributions over time. I personally use Betterment because the fees are reasonable and I like the automated platform. To learn more about investing, read our article: Understanding Investment Accounts.